What are Northern Lights? They are a natural light display in the sky that is powered by the Solar Wind as it is passing Earth. The Southern Lights can be viewed in the Southern Hemisphere and are almost identical. 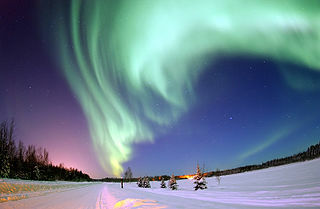 Their official names are Aurora Borealis in the Northern Hemisphere and the Aurora Australius in the Southern Hemisphere. The Aurora Borealis was named by Pierre Gassendi in 1621. Aurora is the Roman goddess of dawn. Borealis is the Greek word for the north wind. The Alaska Northern Lights are most active late at night or early in the morning when there is a new moon. What are northern lights and when are the best months to watch them is a question often asked by people. The four best months to watch the Aurora Borealis is February, March, September and October. They are large magnetic storms on the Sun are related to the peak of the eleven-year sunspot cycle. After intense solar activity at the peak of the sunspot cycle the Solar Wind takes two days to reach the Earth and affect the Earth's atmosphere with increased Northern Lights and Southern Lights displays. Radiation is emitted as light when atoms in the upper atmosphere are struck by electrons and protons in the Solar Wind. The electrons and protons are energy particles that increase during large magnetic storms. The Northern Lights occur between 50 and 200 miles above the Earth. They can last for several hours filling the sky with glowing and dancing curtains of green, pink, yellow and orange lights. Green is the most common aurora color and red is the rarest.